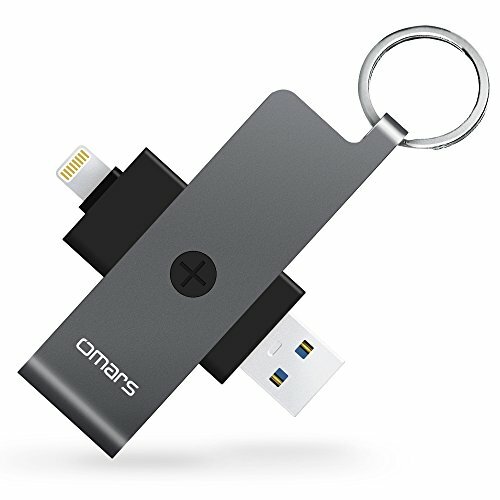 One card reader (Micro SD Card not included) with two connectors (USB 3.0 and lightning connector): allows to be used as a micro SD card reader for direct data exchange between iPhone/iPad, micro SD card and computers. User friendly App \"Witstick\" with more features: 1.Take photos, videos and audios directly to external storage; 2.Backup and manage files easily; 3.Encrypt single files in the flash drive with Touch ID; 4.Backup and restore contacts at one click; 5.Share files with Apps. Speedy transfer performance: You can transfer a 3GB HD video or Photos in less than one minute. Support FAT32 and exFAT (enables you to transfer single files larger than 4GB). Just plug and play: Document viewer for all major file formats. Manage all your data directly on iOS-Device. Playback the videos/music directly from external memory Stick. Quality assurance: certified by CE, FCC & MFi, 12-month warranty & lifetime professional service. Please be advised that copy-right protected music/video Files from the third App CANNOT be transferred to the micro SD card. Best part is It’s Apple MFI Certified .